At the turn of the century, rival illusionists Alfred Borden and Robert Angier engage in a competition to out do one another with high personal costs. Their fight leads one of the men to Colorado where, with the aid of Nikola Tesla, he discovers a "real" magic trick that transcends illusion and science. After Batman Begins, the public was hungry for a sequel. However, in order to not become totally lost and stagnant in his universe, Christopher Nolan chose a smaller project to occupy the time between Batman films. The result was one of the best films of 2006. I remember seeing this film in theaters the week after The Departed and thinking nothing could be as good as that film. Turns out I was wrong. This is a brilliant movie with layers upon layers of mystery and suspense. 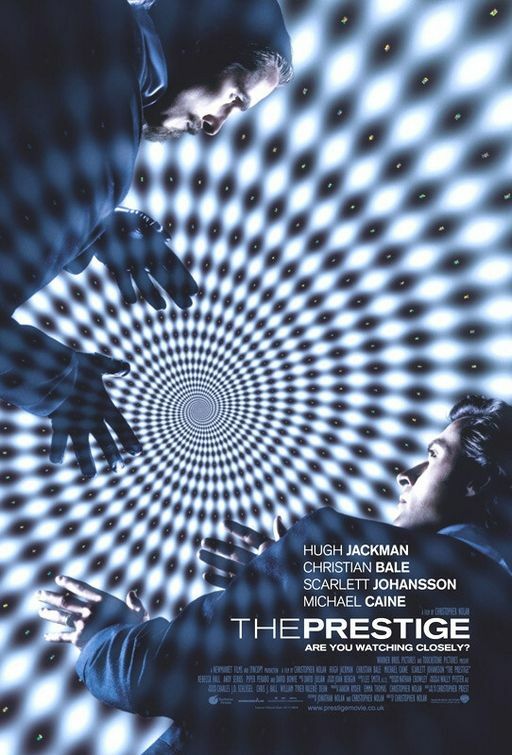 At its core, The Prestige is a morality tale. Both men have an unhealthy obsession with one-upping the other and this leads to some rather underhanded moves on both sides of the coin. However, this film is much more than a simple story about the dangers of obsession. The twists and turns throughout the film are so deftly woven in that by the time you find out the secrets, you realize that you were not really looking for it in the first place. The narrative structure reflects the spiral of the story. It is some sort of bizarre frame story that goes into itself and its characters and then bursts right back out into the bigger picture of it all. Although the scale of the film is more toned down than his Batman films, the complexity and tenacity of it all are just as huge. At the end of the film, you come to realize that much like a magic trick, it has three acts in which the third is a massive reveal that makes you want to see it again as soon as its over. Going through this film for at least the seventh time last week, I found myself still picking up on minutiae in the dialog and subtle looks between certain characters that lend this mind destroying picture to endless multiple viewings. I would argue that this is Nolan's most ambitious picture to date, with it spiraling timeline and steady build up to a finale you won't soon forget. This is the film that solidified Nolan as a director to watch in my book, and is a film I will still watch years down the road.